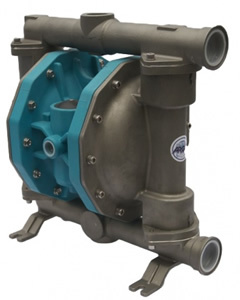 The current range of AISI 316 made pumps includes sizes from 1/2″ inch to 2″ inches. These pumps address fluids with neutral pH or aggressive abrasive and viscous. Casings and manifolds are lost wax cast and sport well finished surfaces with modern and attractive design, The quality of cast parts is laboratory checked to assure structural integrity and the desiderate internal an external degree of finishing. The central casing is made of injection moulded glass fibre reinforced polypropylene for its broad chemical resistance to corrosive chemicals and to corrosive atmospheres. Thermoplastic diaphragms offer high resistance to chemical corrosion and abrasion and deliver long life cycles; the broad range of applications these materials are adequate to, eases the choice of the correct pump execution for the specific application. Diaphragms are available in Keyflex®, Santoprene®, and Polyurethane. Elastomeric diaphragms deploy blend of rubbers embedding nylon reinforcing mesh designed to increse their mechanical resistance. Most common elastomeric rubbers are nitrilic (NBR) and ethylene propylene diene monomer (EPDM) based.